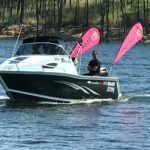 Three tagged Barramundi worth $5,000 each will be up for grabs as part of the 2018 Boyne Tannum Hook Up. The Gladstone Area Water Board (GAWB) has partnered with the Boyne Tannum Hook Up to sponsor the Tagged Fish Category. 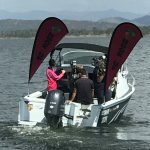 GAWB Chief Operating Officer, John Tumbers, said three adult Barramundi would be caught from Lake Awoonga over the coming weeks and be fitted with a special BTHU tag before being released back into the Lake in time for the Hook-Up. “If caught over the Hook Up weekend by a registered angler, each Barramundi is worth $5,000,” Mr Tumbers said. “For GAWB, this is the perfect partnership, because, like the Hook-Up team, we want to promote sustainable recreational fishing within the region. “We have Hook-Up anglers fish the Lake every year, but this year there will be an extra incentive with those three prize fish up for grabs. “I look forward to seeing plenty of anglers on and around the Lake at the end of the month”. BTHU President, Jennifer McGuire, said the tagged Barramundi must be presented under the BTHU live category rules and the tag checked by the officials to claim the $5,000 prize money. 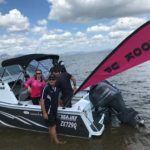 The Hook-Up team were on site at Lake Awoonga this morning to test drive the Hook-Up prize boat while assisting GAWB release Barramundi fingerlings into the Lake. Mr Laws said they had just taken delivery of the first prize boat, valued at $65,000. 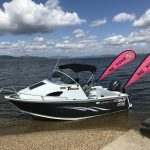 “Thanks to our friends at Sea Jay, we’ve just taken delivery of a 5.5m aluminium Trojan with a Yamaha 150hp 4 stroke outboard. 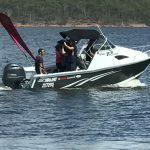 “It’s fitted out with Garmin electronics, trailer and safety gear and valued at $65,000. 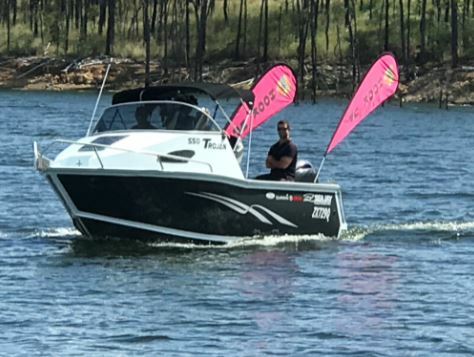 “The Hook Up Team had a great time giving it a test run on Lake Awoonga this morning and I’m sure the lucky winner will have years of enjoyment ahead of them. Approximately 2,000 Barramundi fingerlings were released into the Lake this morning as part of GAWBs restocking program. Mr Tumbers said each year GAWB stocked approximately 300,000 fingerlings into the Lake. 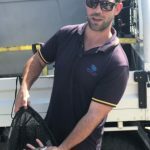 “As part of our environmental licence, we stock mainly Barramundi but also a small numbers of Mullet and Mangrove Jack into the Lake,” Mr Tumbers said. 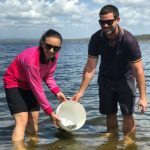 “Our data shows that Lake Awoonga serves as a great ‘nursery’ for the fingerlings, with recaptures demonstrating above average growth rates”. The 2018 BTHU will run from Friday 4 to Sunday 6 May 2018. Tickets are available at www.boynetannumhookup.com.au or at Pat’s Tackleworld Gladstone, LJ’s Complete Angler Gladstone or Boyne Bait and Tackle.